Noord, meaning north in Dutch, geographically encompasses the northern reaches of the island, including Palm Beach, the epicentre of tourism in Aruba and home to the hotel district, world-class restaurants and cafés, nightclubs and bars, casinos, shopping and the protected wetlands of the Bubali Plas Bird Sanctuary. Noord’s reach to our northwest and northern coastlines includes the beaches of Palm Beach, Fisherman’s Huts (a windsurfing and kiteboarding hub), Malmok and Boca Catalina and Arashi (spectacular snorkelling spots). Along the northern coast, the crashing waves and limestone cliffs provide a beautifully dramatic change of scenery. 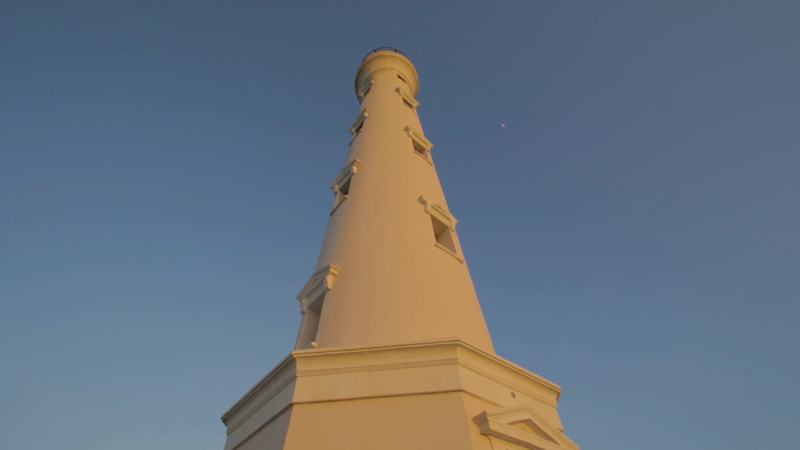 The historic and recently refurbished California Lighthouse anchors the district of Noord, casting a watchful eye over the area, including the island’s PGA Championship golf course, Tierra del Sol Resort and Golf. The iconic grace of Santa Anna Catholic Church lies in the heart of the district, while the historic Alto Vista Chapel, built in 1750, sits perched on a hill overlooking the northern coastline. With Noord’s proximity to major hotels, shopping centres and plazas, many locals –particularly those in the hospitality industry –have settled in this area, making it the most populated district on the island. Long-established, traditional neighbourhoods include Alto Vista, Rooi Santo, Bakval, Boroncana, Kurimiauw and Kamay, while newer homes can be found in Gold Coast Residence and Tierra del Sol and the areas named after semi-precious stones, including Ruby, Opal and Topaz. The neighbourhoods of Montana, Washington, Gasparito and Koyari can be found in central and southern Noord. In the area of Noord Aruba, there will never be a shortage of adventures to go on. You will find a wide selection of Noord Restaurants in the Palm Beach area opposite the Noord resorts. From Italian and American to Japanese and Argentinian, there is so much variety in cuisine here. If you intend to stay at one of the many Noord hotels, you’re in for a treat. You can stay at one of the luxurious beach resorts, or choose a more boutique experience inland. No matter what type of accommodation you choose, you can rest assured that you will always be close to the best activities the area has to offer. Go for a quick drive or a leisurely stroll and explore all the fun things to do in Noord!